The legendary statesman and British Politician that had been utmost respected for leading the country of Great Britain during the Second World War had also been known to have carried the responsibility for establishing a renowned reputation for premium cigars. Churchill, the fruitful writer, stern battlefield leader and a vital political member was known for smoking anywhere from eight to ten premium cigars a day. These premium cigars, that were known to be Cuban in nature, have been remembered since for being extremely flavorful and great in taste. Churchill’s primary preference was the Romeo y Julieta brand, a brand that to this day produces a flavorful smoke with a sweet hint of spices. 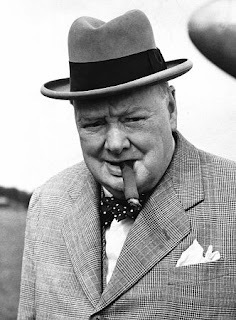 Winston Churchill had a strong belief system involving the smoking of premium cigars, where the location and timing would cease to matter. One such occasion for which Churchill’s smoking is utmost noted for took place during his travels across the seas. Churchill had traveled in high altitude, non-pressurized flights that often required oxygen masks for the airborne occupants to bear. Reluctant to abide by the regulations, the prime minister had requested a special oxygen mask to be made that would permit him to smoke during flight. As the textbooks state, his request was executed. The legendary prime minister of Great Britain, Winston Churchill, had adhered to the belief that smoking and drinking of alcohol prior to, after and during meals was a sacred right of his. When Churchill hosted a luncheon for the King of Saudi Arabia, Ibn Sa’ud, he quickly became aware of the fact that the king had a previously established personal sentiment that rendered the refusal for any smoking to be done by anyone around him. King Ibn Sa’ud’s sentiment was quickly changed when him and Churchill came to a common ground understanding about Churchill’s belief in his sacred rights.